One of the reasons why we can organize something like Country Cup or OC Challenges is due to the partners. None of the partners have any say on the set-up of any of the CC/HOC competitions: not on hardware, not on benchmarks, not on duration, not on timeframe and so on. I think it's good, since it gives everyone the opportunity to use whatever he likes. We're currently putting together a team-based version of the Country Cup. It's pretty similar from set-up but should be longer both in terms of overall timeframe (multiple months) and stage timeframe (more time for each stage). I was wondering how you guys felt about putting a vendor limitation one of the stages of that type of competition. Note: we (=hwbot) would still be making ALL the decisions regarding benchmark, hardware and timeframe. So, it's not like we'd allow GBT or MSI to have everyone buy their most expensive board for a stage. It would be more something like, ehrm, limiting the CC11 IGP stage to GIGA or MSI boards. The underlying idea being to get the partners involved in OC comps that don't revolve around vendor-only WR attemps. Feel free to express how you feel about this, but please with argumentation. I know it's easy to shout "hell no", but I'd like to know why you don't want it. Again, the idea is NOT to have the entire competition limited to brands, but just one or two stages, AND that the vendor limitation would not force competing teams to make huge investments to join the stage. No vendor would have any decision-making power; just the ability to see their products being used in a comp. you can always divide countries..
again a competition is fun if everybody or most have chances..
again hw selection for competition is vital for having a good competition. divide countries ? what are you talking about... ? I think that is the entire point. If the Country Cup is about which country has the greatest overclockers in the world, the format does not lend itself to proving that. All that it does is prove which country is best at "organising and getting people to work together" and some countries have distinct advantage based on geographic size or densely populated areas. Does one country using the exact same set of RAM for each of the five scores prove they are the best memory clockers on the planet or that they are the best at getting five guys with DDR3 boards together in a room with one/two guys who knows how to best take advantage of it? I have a question I just realised I don't really understand competition points. Is that for each stage of the competition or the final ranking at the end? Who on each team gets the points? What happened to the Monthly competitions? Is HWBOT only hosting vendor based comps now? I think my gear has gained a fine layer of dust on it, time to get it back in action! Anything on the horizon? The team cup took over the monthly competitions this summer, but I think you are right that for October there should be a classic HWBOT competition again. I'll poke massman. Agreed. I'm bored. Let's go with the monthly's again. Figured the Team Cup would've worn people down, so a month break would be appreciated. Nice! Although it has been more than a month since the Team Cup, time to wreck some stuff! 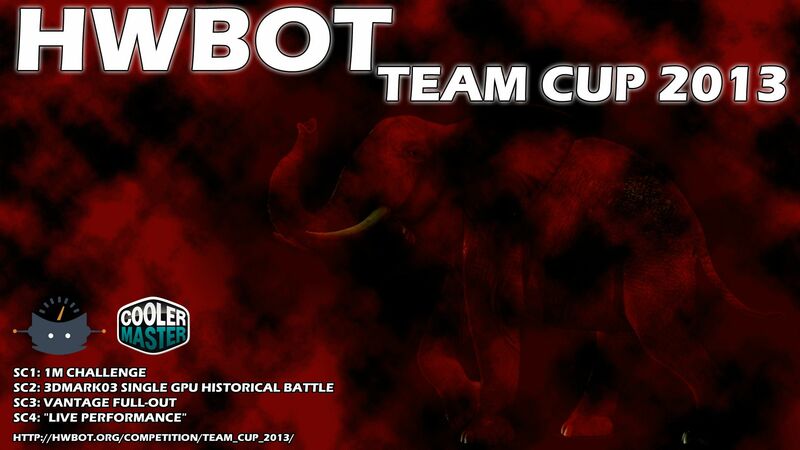 Not even a write up or anything on the hwbot team cup that finished in August! Sent out prizes but nothing else. Got beat in a Geforce stage by someone who cheated. My thoughts are, "be very quite, let's just sweep it all under the rug and hope everyone forgets"! Competitions have become a joke! Have reported the 'cheated score' ? And yes, I always like to add a little comedy to the work I do. You Banned him already. I will not post the name here because I feel it is improper. The results still stand without any writeup. Geforce 7 series points do reflect the ban! Team points do not! Other teams should have moved up significantly as this user had a lot of the high scores. Like I said, Sweep it under the rug and hope everyone forgets about it! It's over mate, not worth worrying about. You are right on the mark bro! Going to forget about this and move forward with the team! looking for the back ground for the team cup comp, the link not working. looking for the back ground the link not working. Anyone getting this error when going to submit a score? Sorry, an error occured. Please try again or contact the HWBOT crew. What about new Team Cup or other challenge between teams?